Before an invited audience made up of guests from the worlds of politics, commerce, research and industry, the Federal Transport Minister Alexander Dobrindt has now fired the starting gun for the age of real-time digital communication. According to the minister, 5G technology, along with the sectors set to benefit most from it, including Industry 4.0, Healthcare 4.0 and Mobility 4.0, will once again bring added value to Germany and Europe. Because, he said, the first round of the digital revolution has passed the region by. "Anyone who rejects the digital revolution," asserts Dobrindt, "is bound to fail." During the panel Claudia Nemat underlines the chances of 5G. ​​​​​​​The opportunities posed by 5G – the next revolutionary step along the road to digitization – is now the subject of discussion on a wide range of platforms. Federal Health Minister Hermann Gröhe uses a couple of simple numbers to illustrate the complexity of the task: 70 million patient records, 200,000 doctors, and 2,000 hospitals and clinics need to be connected with one another. Claudia Nemat, Board member at Deutsche Telekom responsible for Europe and Technology, also underlined the opportunities presented by 5G. To be ready for 5G, providers will need to master a new technology mix, build out their infrastructure, and define the new standards needed. She believes that the future of telecommunications depends on 5G, i.e., the overarching standard uniting the wide range of technologies used in the fixed network and in mobile communications. "If we can do that right together, we in Europe will retain our competitiveness and will avoid becoming a technology museum." At the event, which was held in the Federal Ministry of Transport, participants repeatedly underlined the importance of the new network architecture that 5G will bring along with it for the entire manufacturing industry, but also for the logistics sector. Participants were unanimous that broad bandwidths and the shortest possible response times (or latency) – which have to be within a few milliseconds – are set to benefit both industrial and private users. 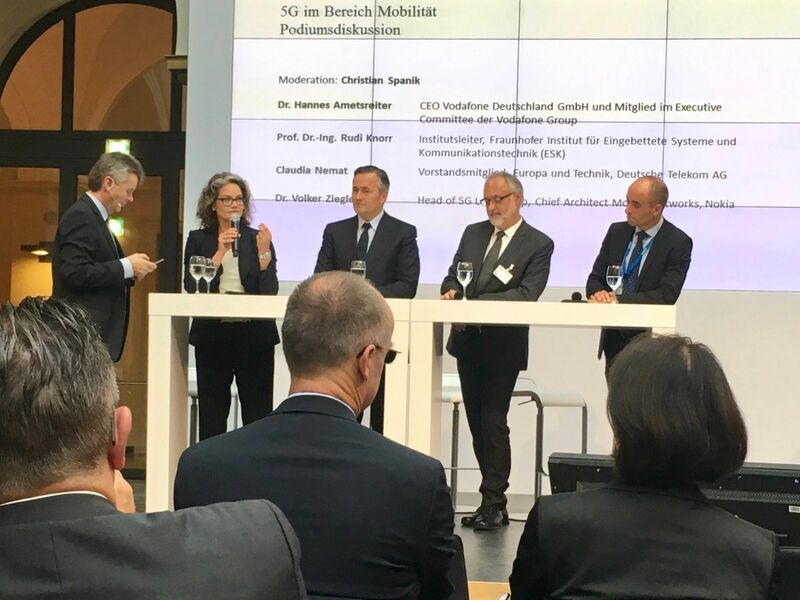 Before the conference opened in Berlin, Minister Dobrindt launched his new initiative for the 5G build-out. It aims to accelerate the process for making frequencies available as one of the basic prerequisites for 5G in Europe. At the same time, the minister intends to drive on 5G-related research, with the aim of taking on a leadership role in the process of international standardization. Finally, he also intends to speed up the build-out of new 5G infrastructure. In this regard, the minister used the occasion to announce his aim of fully equipping all main traffic routes and Germany's 20 largest cities for 5G by 2025.